Joe has many customers, but none as harsh as one girl...A very powerful fiction from a young writer! Rating: R NEW!!! The "Cecie Martin" series by "Matrix Refugee"
One of THOSE in our midst! Halloween in Rouge City...a killer is roaming the streets...is Joe the next victim? And how does Cecie cope with her feelings about Joe as she fights to protect him? A song-fic based on David Lee Roth's "Just a Gigolo" -- Joe's thoughts just before his destruction. Rating: PG (In Portuguese) NEW!! Translated by "Danielle Swinton" NEW LINK!!! After saving him from the Flesh Fair, a young woman tries to show Joe, the lover bot, that not all Orga are evil and that he deserves to be treated than he has past. 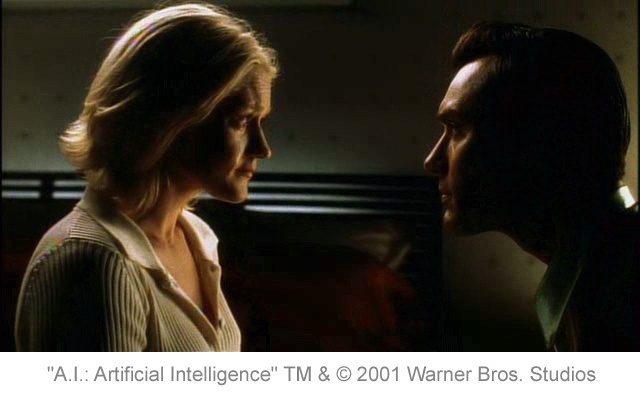 Written by Callista Loveday, another fan helps complete a classic "A.I." fic. I only found this recently, and it satisfies very well! Enjoy!! NEW!!! 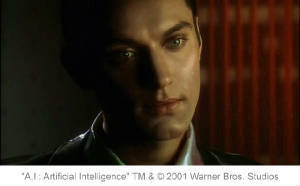 The "Zenon Eyes" Series by "Matrix Refugee"
Zenon Eyes I: "I Only Have Eyes for You"
Zenon Eyes II: "I'll Be Seeing You"
Zenon Eyes III: "I'm Beginning to See the Light"
A.I.--"The Best Day" or "Gigolo Joe Goes to the Park"
By "KakyaJun" -- WARNING!!! This is a classic parody fic which appeared once on the "A.I." fanfiction Yahoo! Group. Do NOT eat or drink anything while reading it! May also cause excessive groaning!!! YOU HAVE BEEN WARNED!!!! *'s indicate fictions found exclusively on the fanfic page of "Clear and Haunting Visions"